A. Bircher, K. Alexis, M. Burri, P. Oettershagen, S. Omari, T. Mantel, R. Siegwart, "Structural Inspection Path Planning via Iterative Viewpoint Resampling with Application to Aerial Robotics", IEEE International Conference on Robotics & Automation, May 26-30, 2015 (ICRA 2015), Seattle, Washington, USA . ​The goal of a Structural Inspection Path Planning design is to be able to provide full coverage solutions that are of low cost (in terms of overall path distance or time-of-travel), are computed in short time and with low computational load, while accounting for motion constraints of the vehicle and sensor limitations (e.g. Field of View). They are prone to be suboptimal due to the two-step separation of the problem. As a response to the abovementioned limitations, the problem Structural Inspection Planner (SIP), revisits the concept of 2-step optimization based inspection path planning. Essentially, SIP is driven by the idea that with a continuously (or very fast) sampling sensor, the number of viewpoints is not necessarily important but mostly their configuration in space. SIP does not search for a minimal set of viewpoints but rather for a set of full coverage viewpoints positioned such that the overall path gets minimized. SIP employs an iterative, viewpoint alternation and route re-computation 2-step optimization paradigm. Therefore, it guarantees to find feasible path solutions for both holonomic and nonholonomic vehicles and typically arrives at full-coverage solutions that are of low-cost. To account for the limited camera Field of View (FoV), it imposes a revoluted 2D-cone constraint. This is a nonconvex problem which is then convexified by dividing the problem into Nc equal convex pieces. The concept is visualized in Figure 2. Figure 2: Viewpoint optimization process for finding admissible viewpoints that satisfy the sensing limitations of the robot. 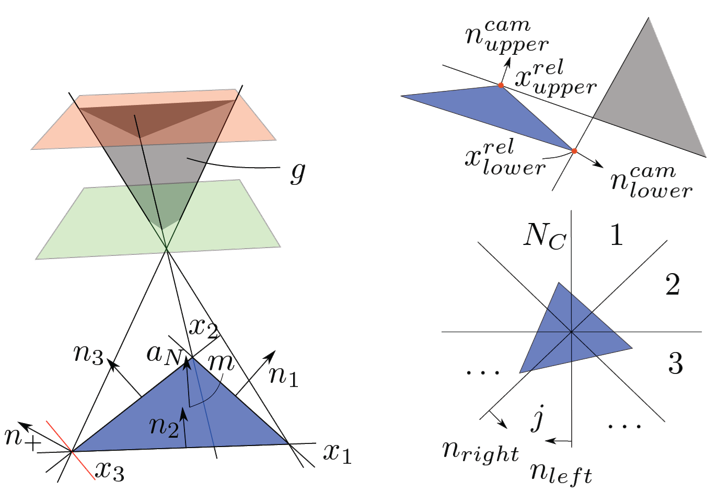 On the left the incidence angle constraints on a triangular surface are shown. On the right the camera constraints and the revoluted 2D-cone convexification is shown. In its current implementation, SIP relies on State-space sampling methods, while an extension to control-space sampling methods is possible. To find path solutions from one viewpoint to the other, it employs a Boundary Value Solver (BVS) for holonomic or nonholonomic vehicle configurations and relies on the optimal Rapidly-exploring Random Tree (RRT*) algorithm to derive collision-free paths. To solve for the per-iteration SIP tour optimization and derive the corresponding TSP solution, the method relies on the LKH solver. LKH is an effective implementation of the Lin-Kernighan heuristic for solving the Traveling Salesman Problem. The Lin-Kernighan solver (also called the Lin-Kernighan-Helsgaun solver) is among the most efficient solvers of the TSP and it is employing the concept of k-opt moves. ​The concept of k-moves is visualized in Figure 3. Figure 3: Visualization of the k-moves process. It is highlighted again, that the aforementioned two steps (viewpoint optimization and tour computation) are executed in an iterative fashion such that the algorithm derives solutions of improved cost. The following video presents an execution of the SIP algorithm and enables intuitive understanding of its operation. The first part of the video simply presents the mesh visualization process. Figure 4: Robot platforms used for the SIP experimental studies. Both fixed-wing and rotorcraft unmanned aerial vehicles were employed for evaluation purposes. As this corresponds to an open research topic, interested students may contact Dr. Kostas Alexis to discuss potential projects. As mentioned, the presented Structural Inspection Planner is released as an opens-source ROS package. Follow the instructions below to get it running on your ROS-enabled machine. The structural inspection path planning algorithm presented in our paper contribution  is released as an open-source toolbox. The algorithm assumes a triangular mesh representation of the structure and employs an alternating two-step optimization paradigm to find good viewpoints that together provide full coverage and a connecting path that has low cost. In every iteration, the viewpoints are chosen such that the connection cost is reduced and, subsequently, the tour is optimized. Vehicle and sensor limitations are respected within both steps. 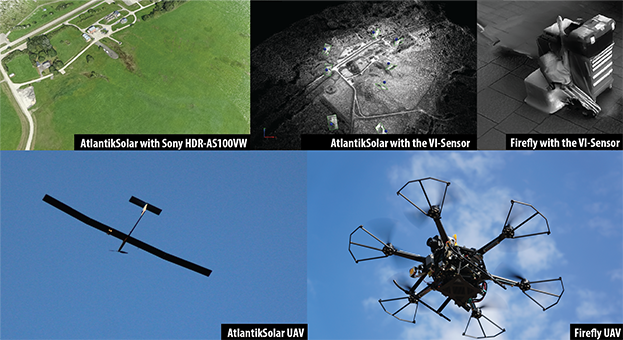 Sample implementations are provided for rotorcraft and fixed-wing unmanned aerial robots. To display the progress, chose ‘/kopt_frame’ as fixed frame or publish a suitable transform. Detailed documentation may be found at the Wiki! A. Bircher, K. Alexis, M. Burri, P. Oettershagen, S. Omari, T. Mantel and R. Siegwart, “Structural inspection path planning via iterative viewpoint resampling with application to aerial robotics,” in Robotics and Automation (ICRA), 2015 IEEE International Conference on, May 2015, pp. 6423–6430. K. Helsguan, “An effective implementation of the lin-kernighan traveling salesman heuristic”, European Journal of Operational Research, vol. 126, no. 1, pp. 106-130, 2000. This algorithm was developed by Andreas Bircher with the help and support of the members of the Autonomous Systems Lab. The work was supported by the European Commission-funded projects AEROWORKS and ICARUS.